Something magical happened at the Bookmans warehouse the other day, a collaboration that stretches across continents! All month long, Bookmans has been collaborating with organizations and business across the state from the Educational Enrichment Foundation and Ben’s Bells in Tucson to Voices for CASA Children in Phoenix, and the Literacy Center in Flagstaff for shop local give local month. But we don’t just keep it local at Bookmans. In fact, some of Bookmans giving has even made its way all the way to Nigeria! Dating back to 2005, in conjunction with the Institute of Research on African Women, Children, and Culture at the University of Arizona, Bookmans is on its 4th shipment of 30,000 lbs of books. I spoke to Leslye Obiora J.S.D, who coordinates this 13-year effort through the institute. She explained that “The first shipment … in 2005 or so to Chief Emeka Ndu was for a community school. The current [shipment] goes to Dr. Sylvester Monye for a community development initiative and institute. In between were a couple of other shipments, including one facilitated by Mallam Sule Adamu for the Arewa Center.” Each shipment was about 30,000 lbs of books for communities and organizations in Nigeria. If you think about it, thanks to the efforts from Bookmans warehouse staff and management, some logistics and the coordination of Leslye, Bookmans ships books from YOU, the community across continents! In doing so, we give the books a new life since all Bookmans merchandise comes from the community. We are grateful to make such a large scale donation on behalf of Bookmans and our customers. You can check out a video of our donation in action – from the Tucson end, anyway! 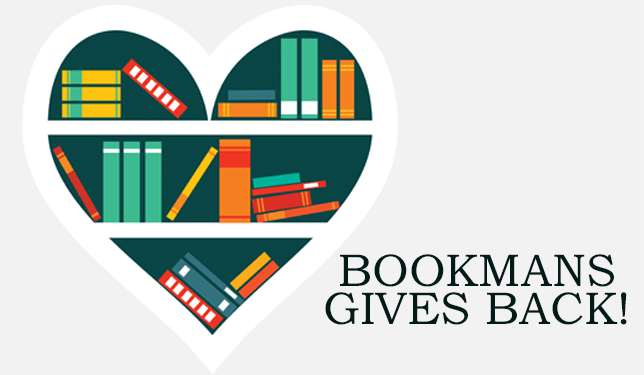 Follow this link to see how Bookmans Gives Back! Our thanks to Leslye Obiora, J.D.S. and the volunteers who came to pack all 30,000 pounds of books to be shipped. Also, a big thank you goes to the Bookmans warehouse team too. Equally important, got everything ready for transport and on the truck. We couldn’t have done it without them – or YOU! That’s right – your book donations make an impact in your local community and beyond!